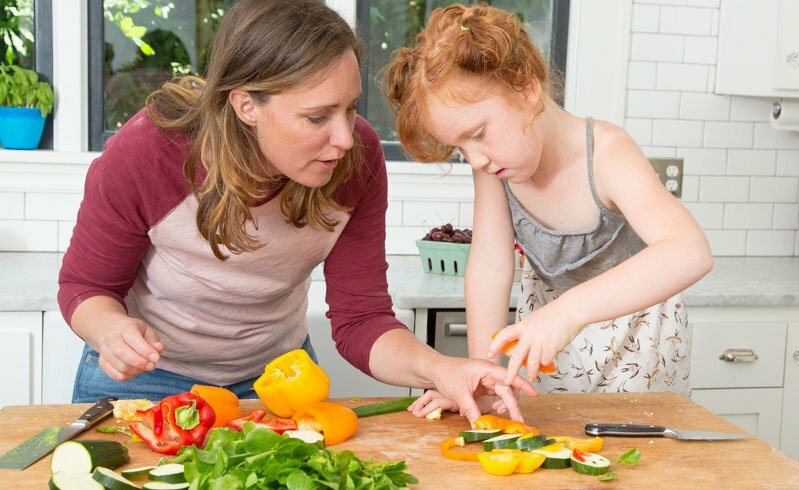 Kids in the kitchen will eat their veggies! Hipcooks classes are for adults. And they’ll stay that way. So if you’ve got kiddos, take a night off and come to a class. Enjoy an adult beverage or two. Meet and mingle with other adults…it’s a game changer! But do bring home lots of great new culinary tricks and ideas, to keep your home kitchens sassy, healthy and delicious. I love to take Hipcooks concepts and involve Lucia. In our Tapas class, we make an outstanding Pure de Garbanzo that Lucia was not touching with a 10-foot pole. Until we made fun dipping veggies. Grab your cutie and make all kinds of creatures: butterflies and flowers, trucks and cars, wildlife panoramas. For the yummus, pop the garbanzos in a food processor with a bit of water. Lucia does not like too much olive oil. She permits me a dash. However, she loves butter and came up with this delectable addition on her own. Lemon will help the processing, and you may need a bit of water. Must be child-tested and approved for finishing touches, like salt.